Be prepared for travel emergencies — and get help fast — with the TravelSmartTM app from Allianz Global Assistance. TravelSmartTM is your trusted global companion, making it easy to manage your Allianz Travel Insurance policy, check your flight status in real time, locate emergency services and medical providers abroad, contact our assistance center, and more. In Fall 2017, we completely redesigned TravelSmartTM and loaded the app with new features that enable you to travel confidently around the world. You don’t have to be an Allianz Global Assistance policyholder to use the TravelSmartTM app. Track your flight status from the home screen. Get real-time flight updates and boarding gate information for all the flights in your itinerary – for any airline! Our My Trips feature allows you to add your upcoming flights into the TravelSmartTM app, so you can always see the details for the next leg of your journey. Find a hospital, pharmacy, police station, or the U.S. Embassy in seconds. In addition to our extensive directory of carefully vetted hospitals, we provide a detailed list of doctors, pharmacies, police stations, and U.S. embassies within 10km of your location. 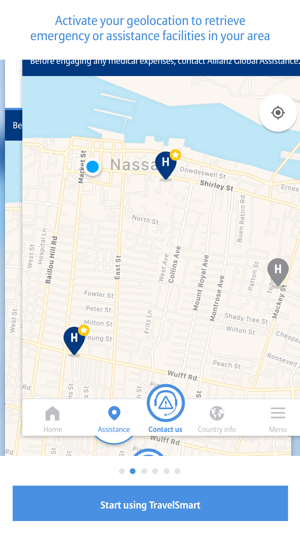 Our geolocation service enables you to find the right facility fast and connects with Apple or Google Maps to get you turn-by-turn directions. Nothing gets lost in translation. Quick: How do you say “food poisoning” in Portuguese? Get 60+ first aid terms translated from English to 18 common foreign languages for easy reference if you need to communicate about your health while abroad. If you need to fill an emergency prescription overseas, TravelSmartTM gives you the universal name for more than 750 common medications so you can be confident you’re asking for the medication you need. Get instant access to global emergency numbers. Did you know 911 doesn’t work in every country? Rapidly access local police, fire, ambulance, and U.S. Embassy phone numbers, right from the TravelSmartTM home screen, by selecting the country you need or by enabling geolocation to sync the numbers with your location. Talk to Allianz Global Assistance fast. In just 3 touches, get connected to our award-winning, 24-hour assistance team that is always available to help our policy holders with travel-related assistance and emergency medical situations. Access your policy in no time. 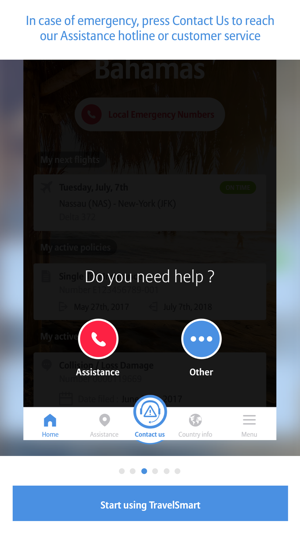 Your travel insurance policy from Allianz Global Assistance is accessible from the app home screen. Tap the policy section to get details about your plan, such as who’s covered under your policy and what benefits you have. See a PDF copy of your policy or contact our customer service team. 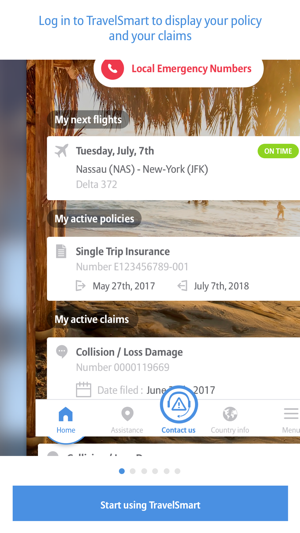 If something happens during your trip, whether a stolen suitcase, a canceled flight or a medical emergency, you can easily confirm your benefits or even start the claims process using the TravelSmartTM app. No purchase necessary to download the TravelSmartTM app. New claims display on dashboard automatically. Updated listing of Allianz preferred hospitals. Added direct emergency assistance numbers. First of all, the app only appears in a vertical format. When I use it on an iPad it’s not only vertical but the same size as it would be on a tiny phone. Can’t you figure a way to go horizontal like most developers do? Second, I’m near the end of my first annual policy and I want to renew. I got an email reminding me of this fact yet there is nowhere, either in the email or the app, for an easy way to renew. Instead you have to input all the same information you did the previous year for both me and my wife. This is a pretty stupid way to get repeat business!! The TravelSmart app by Allianz is my go-to app when dealing with health and safely on the road. As a full-time traveler and someone who is vulnerable to getting sick abroad, I now have the ability to locate nearby hospitals, file claims, and call support 24 hour/day at my fingertips. I highly recommend checking out this useful app to save you time, stress and money before your next trip! Just downloaded, created account and tried to login. No luck. It might be a great app but if I can’t log in, worthless. Looks like tho is an ongoing problem based on prior reviews.